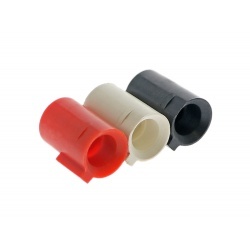 CCT HopUp busking is manufactured by high quality anti-oil rubber material. It can prevent swelling, scratch and crash during the heavy usage. Its re-designed entrance shape can better fit with nozzle movement to prevent jamming. Flared chamber allows BB feeding much smoother. The 70° / 60° / 50° options inside the package are able to enhance different level of spin velocity (70° Low / 60° Middle / 50° High) which is suitable for different shooting environment and range. It is suitable for TM Hi-capa, G series, M&amp;P9 &amp; M4A1 MWS.